Take a look at the record books and you’ll see that no other 250cc motocross bike in the modern four-stroke era has earned more championship titles in AMA Supercross and Motocross than the Kawasaki KX™250F. The 2014 KX250F’s championship-winning technology includes a new Launch Control system, a plug-and-play adjustable ECU, Separate Function Fork (SFF), new motor mounts, revised suspension tuning and an upgraded transmission. Make no mistake, the KX250F is still the dominant player in the 250cc ranks. Ride anything else, and you’ll just be playing catch-up. Along with all that advanced technology and race-proven performance, the KX250F also offers more adjustability than its competition, allowing the rider to fine-tune the motor and suspension capabilities to meet the sport’s rigorous demands like no other bike in its class. 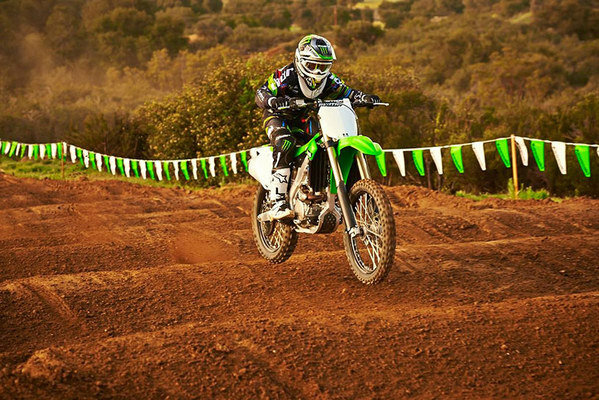 Right off the production line, the KX250F gives a factory advantage to the privateer. The KX250F frame features narrow main spars for excellent ergonomics that offer superior freedom of movement in the saddle. Further enhancing this feeling, the radiator shrouds are small and slim where they contact the rider’s legs. New high-tensile steel front engine mount plates are 29% thinner that last year’s steel plates. The new front mount plates provide a revised chassis rigidity balance that enhances front-end feel and traction. A curved left rear engine hanger bracket helps facilitate light handling and is tuned to boost rear wheel traction. The KX250F’s grips feature a low-density compound that enhances rider comfort while the grips’ position allows for compact ergonomics. The side covers are also as small as possible and form a smooth line with the airbox for easy rider movement. Since a motocross racer moves around so much, the design of the seat/tank interface provides freedom of movement and facilitates forward weight placement for better cornering. The KX250F’s Digital Fuel Injection (DFI®) system features dual injectors that pack a one-two punch, delivering a second dose of fuel on acceleration to maximize the high-rpm power and overrev capabilities of the KX250F. The system’s second injector is located upstream of the throttle body and helps build a wider and more potent spread of power as rpm climbs. The two fine-mist atomizing injectors that feed the 250cc four-stroke powerplant have different body sizes but deliver the same total capacity per cycle. The DFI system comes with three pre-programmed ignition maps which are easily selectable without the use of a laptop computer or any other electronic devices. Maps can quickly be changed between three settings – standard, hard (terrain) and soft (terrain) – by swapping the DFI wire coupler cap clipped to the side of the steering head. No additional accessories are needed to alternate between pre-preprogrammed maps – simply install the appropriate coupler cap to select your desired ignition mode and start winning. The ECU is also fully re-programmable and custom maps can be created by using the accessory KX FI Calibration Kit, the same tool used by Kawasaki factory and privateer teams in AMA and FIM racing. The KX250F features intake ports with a straight intake tract for direct air flow from the airbox to the combustion chamber. This downdraft configuration contributes to strong top-end performance. Performance is also enhanced via the 250F’s exhaust system, which uses a short header with a resonator chamber to help enhance low-end power and reduce noise. 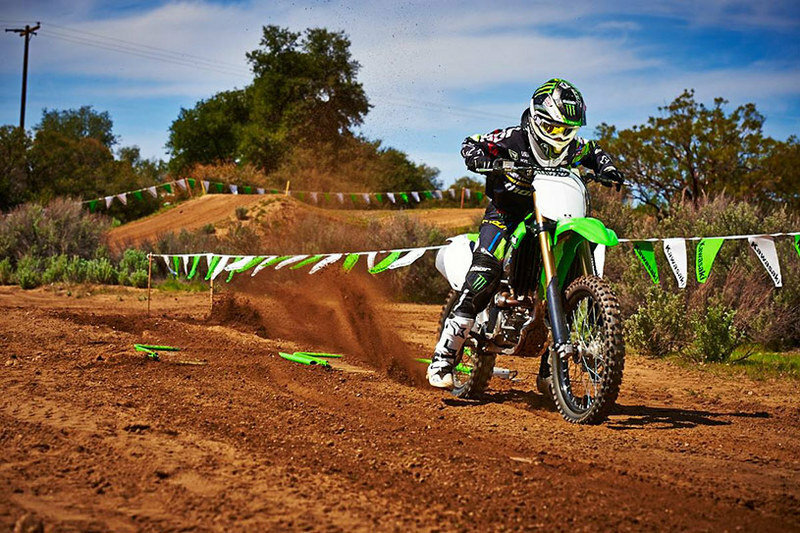 A KX450F-style muffler is short but features a large cross section to help centralize mass while meeting sound requirements. Of course, the KX250F’s ECU settings complement its robust engine character. And the piston profile features a soft arc at the point of greatest pressure to enhance reliability. The bridged box-bottom piston and cylinder walls both feature special surface treatments to minimize wear and enhance long-term durability. Plus, strong intake valve seat material increases durability. 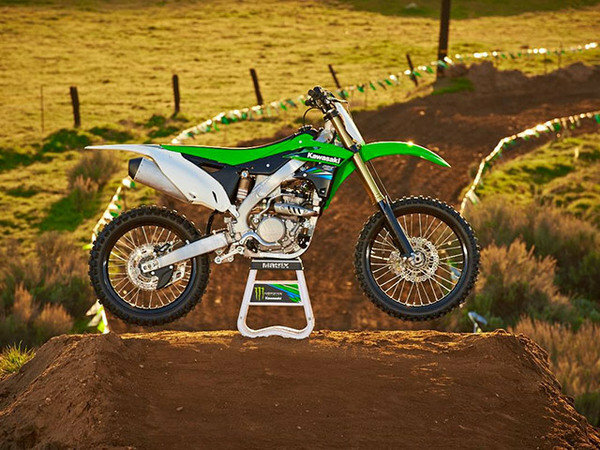 The KX250F was the first production motocross bike to feature Showa’s SFF fork, which separates damping and springing duties into the individual fork legs, and the SFF has proven to be so successful for riders at all skill levels that some of the competition is following suit. The KX250F’s beefy 48mm fork contributes to a more planted feel from the front wheel, thanks to large inner fork tubes with the 30mm main and 35mm sub-pistons that have been re-tuned for 2014 to enhance damping performance through the initial and mid-stroke. These components combine to offer firm damping response without sacrificing rider comfort. A super-hard titanium coating on the outer surface of the inner fork tubes reduces sliding friction and initial stiction to improve overall fork action and contribute to a smoother ride. The extreme surface hardness of this dark blue coating also helps to prevent scratches and damage to the tubes. The KX250F is the only motocross bike in its class to come standard with this race-ready coating. The SFF also features an inverted compression rod that locates the cylinder at the top of the fork and the rod at the bottom. This configuration increases the volume of oil at the bottom of the fork for a more progressive increase in damping force, enabling bottoming resistance to be increased without sacrificing ride quality. The joint rod arrangement aids rigidity, especially in the right fork tube, which contains the spring, resulting in even flex characteristics between the left and right tubes. The closely matched rigidity promotes better handling stability under hard braking and landing from jumps. The Showa-built shock perfectly complements the SFF forks and has revised settings for 2014 to help capatalize on this year’s updated chassis. The shock features dual compression adjustability, allowing high-speed and low-speed damping to be tuned separately. The rear shock also features the Kashima Coating on its cylinder wall, to help reduce friction and smooth the suspension action. These features improve rear wheel traction and allow the KX250F to put the power down more effectively, making it easier than ever to grab the holeshot. Any machine built to go this fast needs to be able to stop just as quickly and the braking systems on the KX250F are excellent. The pushrod-type front brake master cylinder and high-friction brake pads provide strong brake force and enhanced control, especially for the initial bite and initial mid-stroke characteristics. The 2014 KX250F’s white rear fender, silver engine covers and black muffler end cap maintain the factory racer resemblance. And quality race-proven components such as a Renthal aluminum handlebar and black anodized aluminum wheels that are both lightweight and incredibly strong are part of the overall package. The factory team feel of the KX250F is augmented by the lightweight magnesium clutch, generator and cylinder head covers. Plus, the embossed design on the clutch cover is designed to gradually appear as contact from riding boots wears off the painted surface. A sleek, ribless rear hub and butted spokes further reduce unsprung weight. The blue finish on the oil filler, flywheel nut and timing inspection caps contributes to factory looks and sophistication of this class-winning machine, which is bound to top plenty of podiums in the coming year. 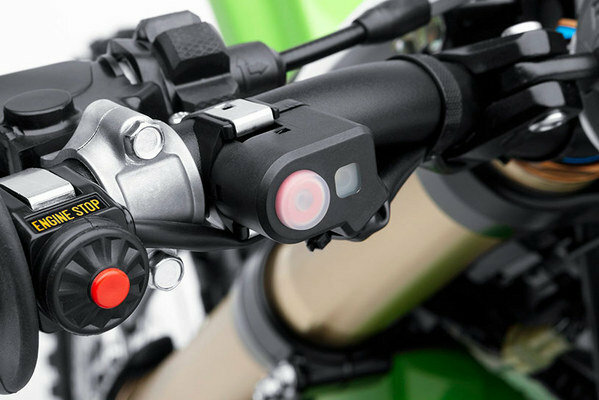 Optional parts available through Kawasaki dealers include lighter/heavier flywheels, front and rear sprockets, solid brake discs, handlebar holder for 1 1/8” handlebar, and stiffer or softer fork and shock springs. Racers who ride their KX250F at designated events are eligible to receive support from Team Green™, Kawasaki’s amateur racing support program. For over 30 years, Team Green has been providing regional support vehicles and highly trained technicians at more than 100 yearly events throughout the United States, offering technical information and assistance to those who race Kawasaki products. Kawasaki also offers a comprehensive contingency program for amateur and professional riders who place well at designated events.